Condensing Boilers are highly efficient boilers that have much lower fuel and running costs than conventional gas boilers. Hydronic Underfloor Heating Systems keep a condensing boiler operating in its most efficient mode all the time. In order to condense the flue gases and consequently be able to extract from them the latent heat of condensation water must return to a condensing boiler from the heating system at below 53C. Hydronic Underfloor Heating can achieve this because it uses low flow temperatures. Gas Condensing boilers work on the principle of recovering as much as possible of the waste heat which is normally rejected to the atmosphere from the flue of a Standard Gas boiler. This is accomplished by using a heat exchanger within the boiler which maximises heat transfer from the burner as well as recovering useful heat which would normally be lost with the flue gases. Condensing boilers use advanced combustion technology which scavenges energy found in the flue gas that would otherwise be lost to the atmosphere resulting in running efficiencies up to 112%. Non Condensing or Standard Gas Boilers are also suitable for Underfloor Heating Systems. Standard Gas Boilers are normally chosen as an option by clients who are less focused on energy efficiency and running costs are more focused on “installation cost”. 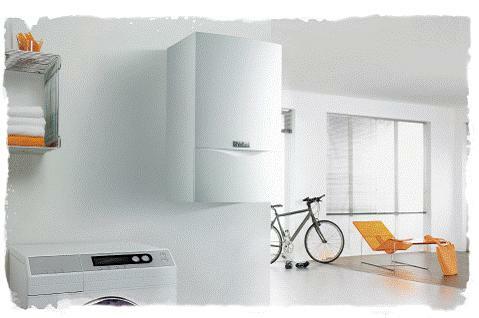 Examples of Standard Gas Boilers are our Tahiti Fondital Boilers or Rinnai Infinity. The VAILLANT ECO-TEC CONDENSING BOILER Range. The Vaillant ecoTEC condensing boilers from Germany are a premium quality, high performance choice packed with features which result in the most reliable and lowest running cost boiler available today. Tahiti Fondital Boilers are a great option for warm water heating systems.